In this ambitious and provocative text, environmental historian Ted Steinberg offers a sweeping history of our nation--a history that, for the first time, places the environment at the very center of our story. Written with exceptional clarity, Down to Earth re-envisions the story of America "from the ground up." It reveals how focusing on plants, animals, climate, and other ecological factors can radically change the way that we think about the past. Examining such familiar topics as colonization, the industrial revolution, slavery, the Civil War, and the emergence of modern-day consumer culture, Steinberg recounts how the natural world influenced the course of human history. From the colonists' attempts to impose order on the land to modern efforts to sell the wilderness as a consumer good, the author reminds readers that many critical episodes in our history were, in fact, environmental events. He highlights the ways in which we have attempted to reshape and control nature, from Thomas Jefferson's surveying plan, which divided the national landscape into a grid, to the transformation of animals, crops, and even water into commodities. 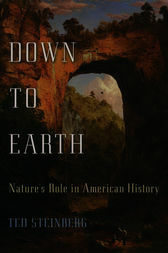 The text is ideal for courses in environmental history, environmental studies, urban studies, economic history, and American history.Passionately argued and thought-provoking, Down to Earth retells our nation's history with nature in the foreground--a perspective that will challenge our view of everything from Jamestown to Disney World. Ted Steinberg is Professor of History and Law at Case Western Reserve University. One of the most brilliant, articulate, and provocative of the rising generation of environmental historians, he is the author of Acts of God: The Unnatural History of Natural Disaster in America, Slide Mountain, or the Folly of Owning Nature, and Nature Incorporated. He lives in Cleveland, Ohio.